SPOKANE, WA—After the eighth such incident this year, Vista Consulting Partners human resources director Beth Shumaker sent out a company-wide email Thursday reminding employees not to scrawl the word “revenge” in blood across any surface in the conference room. “Most of you are already familiar with this rule, but just as a refresher, it’s directly against company policy for an employee to use blood to write ‘revenge’ on the conference room walls, door, or table,” wrote Shumaker, emphasizing that it did not matter if the word was rendered in human or animal blood. 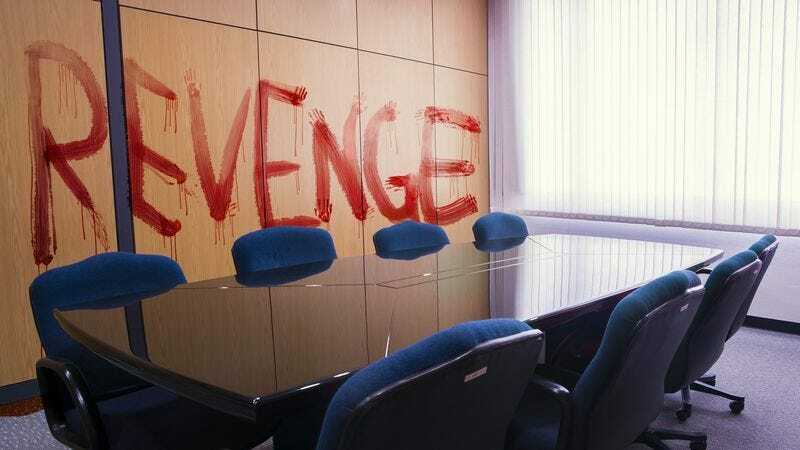 “Remember that we all use this room, and it’s inconsiderate to force your colleagues to delay their meeting to scrub ‘revenge’ off the whiteboard or windows.” Shumaker added that any employee who wanted revenge should simply carve the word into the forehead of his or her supervisor.